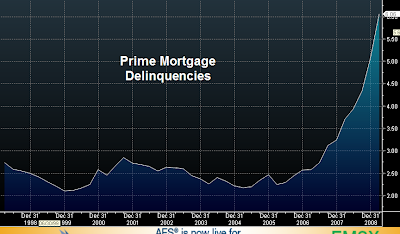 So far there is no end in sight for mortgage delinquencies. The latest data from the Mortgage Bankers Association is showing that over 9% of mortgages out there are now delinquent. This is unprecedented in recent history - see chart (going back to the 70s). A popular myth out there is that it's the subprime defaults that are driving the rapid rise in delinquencies. Subprime mortgage delinquency rate has hit 25% based on the latest data. But the chart below shows the situation with prime mortgages.